LOS ANGELES, California – Conan, the new late-night talk, music and entertainment show hosted by award-winning comedic talent Conan O’Brien showcases O’Brien’s tremendous versatility as a performer as well as his eclectic tastes in musical guest artists--not to mention his all-star house band led by guitarist Jimmy “V” Vivino. 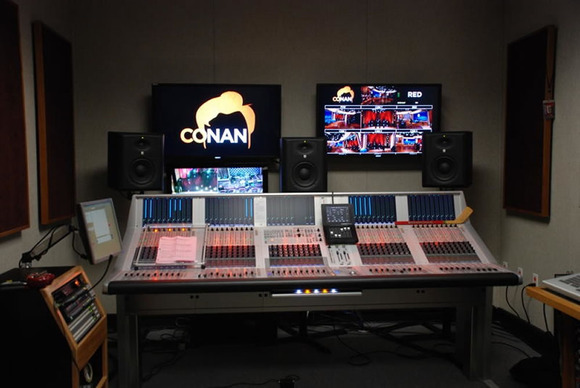 To handle that kind of performance diversity, Conan needed mix consoles for both music and production dialog that could keep up with the fast timing and quick turns of the show, and that’s exactly what the two Studer Vista 9 digital consoles specifically installed for the program at the Warner Bros Studio Facilities’ Stage 15, in Burbank, California provide. Studer Vista 9 consoles are used in both the Music Mix control room and in the Production Audio mix control room, both of which were designed and equipped by Sound Design Corporation.